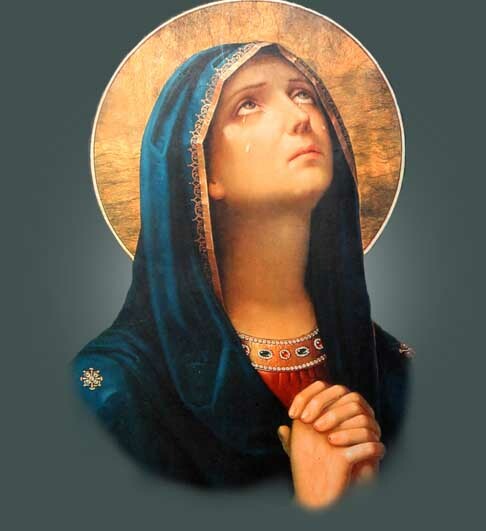 The yes [her continued yes to the Lord that began with her Annunciation yes] of Our Lady does not end on Good Friday and [Christ’s] yielding of the spirit . . . . The faith and love of Our Lady last into Holy Saturday. The dead body of the Son of God lies in the tomb, while His soul descends into Sheol, the Limbo of the Fathers. Jesus goes down into the hideous kingdom of death to proclaim the power of the Cross and the coming victory of the Resurrection and to open Heaven’s gates to Adam and Eve and all the souls of the just. The Apostles, hopeless and forlorn, know none of this. “As yet,” St. John tells us, “they did not know the Scripture, that He must rise from the dead” (Jn 20.9). In all Israel, is there no faith in Jesus? On this silent Saturday, this terrible Shabbat, while the Jews’ true Messiah sleeps the sleep of death, who burns the lights of hope? Is there no loyal remnant? There is, and its name is Mary. In the fortitude of faith, she keeps the Sabbath candles alight for her Son. That is why Saturday, the sacred day of her physical brethren, is Our Lady’s weekly festival. On the first Holy Saturday, in the person of Mary of Nazareth, Israel now an unblemished bride, faces her hardest trial and, through the fortitude of the Holy Spirit, is triumphant. I take great comfort in knowing that Mary always burns the light of hope for me (and you!) as well. Let it be done unto me . . .
in city streets, at tabernacles, in bars? our bloodlines, for this saving parcel of flesh? A lovely little poem by Anne Porter.